Bestsellers that are annoyingly ubiquitous one decade have a funny way of slipping out of the cultural consciousness over the next. It makes the history of publishing a rich site for pop cultural archeology. Case in point: Joanna Scutts’ new book, The Extra Woman: How Marjorie Hillis Led a Generation of Women to Live Alone and Like It. 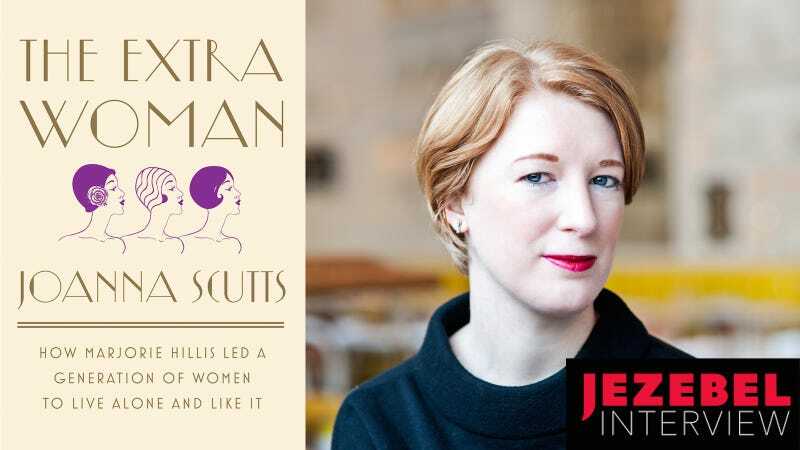 Scutts traces Hillis’s career book by book, Live Alone and Like It as well as several sequels, drawing out the nuances of her life and delving into the broader context of the time. She looks at the books against the backdrop of the era’s economic ups and downs and compares them to other bestsellers, from Carnegie to Dorothy Brande’s Wake Up and Live! The Extra Woman provides a glimpse into the pop cultural world that created all those sparkling musicals you see late at night on TCM, fully of slinky gowns and art deco dressing tables. But it also examines the broader cultural context, offering a window into the mass culture of the Great Depression. It will make you think about the fads of our own uncertain era—the rise of Goop, the hygge enthusiasm, the Marie Kondo obsession. What will be the defining piece of pop cultural ephemera of our time? House Hunters, or Fixer Upper? I spoke to Scutts about Hillis and “extra women,” self-help and negligees. Our conversation has been edited for length and clarity. JEZEBEL: Just to start off with the title, tell me about this idea of “the extra woman.” That’s an idea that predates Marjorie Hillis, right? JOANNA SCUTTS: For sure. She’s coming at it as this idea that society is organized around couples. Especially social life—you would have a dinner party with an even number of people. There’s this very literal idea that a single woman is surplus. She throws the numbers off. But in the period that she’s growing up, especially the United States and in Britain, after World War I, there was a lot of cultural anxiety about “extra women,” whose husbands or whose potential husbands were killed in the war. So it’s actually a generational thing. She doesn’t make that explicit, but I think that’s in the background, this worry that World War I had messed up the demographic numbers in such a way that you were going to have a generation of spinsters, or women who would have been married. There’s this worry about what’s going to happen to these poor women—but also, how are they going to upset the balance of society by not being able to go into the ark two by two and fit within the space that’s been created for them? So what’s the scale of the Live Alone phenomenon? In the course of your book you compare her works to other various books in the era. Something like Dale Carnegie’s How to Win Friends and Influence People is very much still in the cultural consciousness, while How to Live Alone and Like It has fallen out. But what was the scale of her book as a social phenomenon? How popular were these books? That was one of the things that really surprised me about this book. I thought that this was a fun curiosity that my friend had dug up, and I thought that at the time, it must have been a fun little curiosity that didn’t go that far. You have this sense that the things that endure and remain dominant and still sell thousands of copies, like How to Win Friends and Influence People, that must reflect popularity. That the longevity must reflect importance and popularity. But then I started digging into this book and the materials I found relating to its advertising and its reporting and really, she was everywhere. The publishers make a great deal of hay out of the fact that they spot the President reading a copy of this book on his yacht. She’s traveling the country and she’s giving talks. The “live aloner” becomes very quickly this turn of phrase that people are using and talking about. It was a real phenomenon. New York Times, January 10, 1937. Via TimesMachine. There’s a thirst for self-help in the ’30s. But in a month or so of publishing the book, it sold around 100,000 copies. I had no real sense of what that meant until I met with my editor for the first time and she, like, fell off her chair when I said that. And there were multiple printings. So it’s this brief moment, but it’s a real spike. It was clearly touching a nerve—the numbers are much higher than the numbers of women who were wealthy, independent, and actually living the kind of life that Marjorie Hillis is describing, which is a rarified and pretty privileged life. But somehow the way that she makes it feel and the way that she describes it were touching people who were not in that situation at all. In some ways it’s a really destabilizing idea, to challenge this idea of humans existing in the form of mated pairs. But at the same time, it’s interesting, because it becomes this huge marketing bonanza. You can do an entire shop window around negligees and bar carts. I mean, it’s living the dream. Right! It’s interesting because it seems like that’s a tension that’s always been with us in these conversations, even up to now. One of the things she certainly says is there’s all these material trappings but there’s also the attitude that you have to cultivate, which is being happy and self-contained and not wanting other people’s pity or sympathy and presenting this happy, fulfilled vision of yourself to the world. But obviously part of that is to say, that makes you a more attractive potential mate for somebody. Right? There is still always this idea that if you are taking care of yourself, taking care of your appearance, taking care of your home, trying to present this best version of yourself to the world, part of the motivation for that is always, well, that attracts people to you. But I think the reason why it seems to have resonated with this wide readership was because Marjorie Hillis herself was not 25. Here’s a woman in her late 40s who is presenting this image to the world. She does end up getting married—spoiler alert—but also the idea of getting married just because she wanted to and when she’s well past the age of being able to have children, I think it resonated differently. It’s not quite the same as a young, eligible 20-something saying, “Here’s how to live alone and be fabulous,” but with the idea there’s a very deliberate time limit on it. She’s clearly saying that she’s past the age society deems that a woman should be looking for a partner. And she’s been alone and has got to this point where she’s saying, this is my future, this is how I have figured out how to live. She seemed more sincere, I think, in that way. Genuinely, these were things that she had lived and that she knew to be true. That seemed to be part of her appeal. Who was the live aloner? You talk about how Hillis is from a more well-to-do background and sometimes her numbers are a little like that Lucille Bluth GIF: “How much could a banana cost? Ten dollars?” Who was Hillis writing to, as the live aloner? Throughout her career, this was a thing that people said, that she was creating this fantasy that only a very privileged minority could expect to even faintly achieve. And I think that comes out of, also, she worked for Vogue for her career before then, and Vogue of course is also talking to a version of that customer, selling them on a lifestyle that is pretty much out of reach. But at the same time, Vogue magazine is not an expensive thing to buy. And in the same way, the book of Live Alone and Like It cost a dollar fifty. Which was not nothing, but was not out of reach. I think she learned a lot from Vogue. Vogue’s readership doesn’t have to be the people that are featured in its pages, but they have to be able to believe that maybe they could be, or to feel like that’s something they aspire to. And I think she really recognized that the thing that you’re actually buying, the book or the magazine, is within a much larger reach than the lifestyle that it’s promoting. New York Times, April 27, 1937. Via Times Machine. To be perhaps generous to fashion magazines and to self help, smart editors and writers understand that readers can pick and choose from a lifestyle that’s being presented. You don’t necessarily need to buy into everything that she’s suggesting that you need, but there is an attitude underneath it that is more widely applicable. That’s one of the things about Live Alone that is appealing to me. I responded to this lovely retro charm and the idea of having the negligees and the bar cart and all of the things that are very materialistic. But she’s genuine about the idea that if you have things in your home that you’ve chosen and you really love them as objects, they can bring you a genuine pleasure. The pleasure that comes from material objects isn’t shallow, isn’t meaningless, is actually more powerful than we give it credit for. She grew up as the daughter of a minister, but in this period in American history where the culture is trying to figure out where it stands between the stern, moralistic, Puritan inheritance and this massively exploding consumer society. That’s still something that we live with, where we’re going to have all these material goods available to buy, but the price is that we have to feel guilty about it. That cultural push and pull—Marjorie Hillis’s really interesting response to it was saying, you know, if it’s not mindless acquisition, if you’re not buying things because your neighbor has them or because you’re bored or you’re unhappy, but if you’re buying them because you really love them, there’s no reason to be guilty about it. I think that’s still a surprising and not entirely widely accepted message. For all of the department store tie-ins and all of that marketing, the book itself doesn’t suggest that you can just buy your way to the life-alone life. It’s very clear you can buy stuff, but you have to be absolutely sure why you want it and absolutely sure that it’s what you want and not what somebody else is telling you that you should want. And that’s where her moral message comes in. It was interesting to read about the promos, because it seems like the message of her book is more about knowing yourself and creating your own world for yourself. Which is maybe not the easiest thing to work with in a marketing department? I was reading about these promotions and thinking, does the book actually say what you think it said? Yeah, the example that I give is this amazing department store window in San Francisco that’s like, “Make a fuss over yourself!” What she’s actually saying is, you have to toughen up because there’s nobody to make a fuss over your when you’re feeling poorly or when you’re feeling low. And the book is like, make a fuss over yourself and buy a new negligee! That’s not really what she meant by that line. I was not able to track down whether this is true, but in a review of one of her later books that’s kind of sniffy about it, the reviewer mentions that there were actually nightgowns marketed as “the live-alone nightgown.” So it wasn’t just that the stores were selling their own goods next to the book, but apparently there was actually a nightgown produced that was named after the live-aloner. It was one of those rabbit holes that happened late enough in the process that I wasn’t able to chase it up, but I think that really exemplifies it. You can put the stamp of the live-aloner even on an actual object. That really was saying you could buy this lifestyle. But of course the book itself is more complicated than that. Do you think it’s fair to say the book, which came out in 1936, is a product of the Great Depression? I think so, yeah. What is really interesting—the recovery from the Great Depression is very up and down and in ’37, there’s another slump that’s almost as severe as the one in ’29. It’s a real sense that the economy is on a roller coaster, and the government is trying all these programs of the New Deal to try to address this massive problem, but it’s a very spotty and a very uncertain kind of recovery. We think about manufacturing and farming and those industries that were hit incredibly hard and very suddenly by the downturn. But if you were in a city and if you were in a middle-class profession, the downturn was not as severe. It was if you had stocks and savings, but if you were middle class and working in an office position, what really happened was that men’s wages went down. For women, a lot of what the Depression meant was they went out to work for the first time, especially single women. It had this seesawing response in that some people did better, and some people gained a kind of independence. But it’s a very gendered response. So much of what you read about the Depression is really focused on this question of, are we going to be a society in which women are equal breadwinners, or do we need to preserve male breadwinners and female homemakers at all costs? And plenty of states enacted legislation that meant that married women couldn’t stay in jobs. If they were married and there was a man who wanted their job, then they were either not hired or they were fired. But for single women, that wasn’t the case. Also, this is a period when job ads and jobs were very firmly gender segregated anyway. Even if you theoretically weren’t allowing women to take jobs, you were still saying, this job over here is a woman’s job, this over there is a man’s job, and they didn’t suddenly start hiring men to do the office work that was traditionally associated with women. That’s getting off the point of your question quite a long way. But I would say the ways in which the Depression produced this book were in this larger context of self-help, where the idea was that it was up to you now. You might have been able to trust the economy or the stock market to make your fortune for you in the ’20s, but after the crash, you have to make your own way. So much of this self-help boom is about saying you’ve got to think like a winner, you’ve got to be the one who stays positive and optimistic. All of the people around you who are depressed and unhappy, they’re not going to sell anything. They’re not going to be hired or promoted. A lot of these books are chilling about the idea that you have to paste a happy smile over even the most anxious and terrifying economic and global circumstances and keep your sales targets going and your chin up. And when it’s aimed at men, it’s very much about what you feel on the inside doesn’t matter, it’s what you show to the world that really counts. When it’s aimed at women, it’s slightly different thing, because women were not so much doing the corporate and door-to-door sales that a lot of men were doing. They were still expected to be thinking about their home and building the home—that’s still your sphere even if you have a job. Men and women alike of course were feeling anxious and uncertain about the future during this period, and men and women alike were buying these books that taught them think positive and you can be the one who beats the system and rises above and succeeds. But for women, the responsibility was if you have children you have to keep them happy, you have to keep your husband from getting too depressed. New York Times, June 13, 1937. Via TimesMachine. I think what was interesting was that Marjorie Hillis was suggesting that emotional labor that married women and women with families are expected to do—she was sort of saying you should also be doing that for yourself, because your happiness is also your responsibility. Even if you don’t have anyone else’s happiness to take care of, you should also be taking care of your own and trying to make yourself happy. And you’re just as deserving of happiness as a woman with a husband and children. All the parts about all the various self-help publishing phenomena during this era were so interesting. You must have entire Word documents of stuff you had to cut but wanted to include. When I started researching this, my earliest forays were around after 2008, after the crash. So many of the same kind of stories and attitudes come back. This idea that, you know, now that we know that the economy has crashed, we’ve all got to focus on our domestic comfort. This is also a post 9/11 thing as well, turning into the home and trying to find comfort and security in the domestic space. We can be happy with less, we can simplify, we can downsize, we can declutter and focus on what’s important by getting rid of all of the material goods that were weighing us down. You see the same approach and the same ideas coming back. It’s literally like, stop and smell the roses and appreciate what you have. The idea that that’s a response to economic disaster. I don’t mean to dismiss it. I think there’s real value in some ways in giving people a sense of hope and control. But at the same time, you can’t help thinking, that’s really not all it takes. It’s going to take some government regulation and actual political intervention. You’re not going to get there just by throwing out a few outfits that don’t fit you anymore. With that in mind—what can we learn from Marjorie Hillis in 2017? Is there a lesson from her writings or her as a phenomenon that we can take to heart? She’s still so powerful in the way that she lays out the connection between happiness and making your own choices. Figuring out what you value and setting the value for things in your life, and really knowing yourself. She says that it’s something that you have to figure out for yourself. No one else can figure it out for you. And if you don’t figure it out, someone else is going to come impose their values on you. She means value both in the sense of moral value, but also literally, what are you going to spend your money on? What matters to you? It’s definitely a simplified notion. Are you the kind of person who is messy and likes having a lot of stuff around? In that case you probably need a bigger place. And if you’re very tidy and very organized and you can afford the smaller apartment in the center of town, versus the big tumbledown house outside of town. And she explicitly says she’s talking to people who can make that choice, not the choice of not being able to afford a house at all. She says in her second book, which is about budgeting, I’m talking to people who can choose whether or not to butter their bread, not the people who have to go without bread. But she’s definitely saying if you have enough money to be able to make choices, in your life, it’s your responsibility to figure out what those choices should be for your own happiness. And if it involves moving away from your family or abandoning everything that your family or your friends have told you that you should want because you know it’s not for you, then that’s what you have to do. She’s pretty uncompromising about that principle. It’s really what all the other pieces of advice hinge on—knowing yourself and knowing what you value. And I think there’s still a radical quality to that. It’s not just about what you value in terms of morals, it is literally, what makes you happy? What gives you pleasure? We think about pleasure in such guilt-ridden ways. You only ever ask people, oh, what’s your guilty pleasure? And I’m definitely of the school that is like, unless you’re pulling the wings off sparrows or something, you should be pretty open about whatever it is you enjoy, and I think it’s still a battle for women to say that. And for single women to say, on balance, everything that I have as a single person is better than the compromises that I would have to make to be in an unsatisfactory relationship, and I’m not going to give up the happiness that i have in blind pursuit of something that society tells me that I need. It’s very simple when you spell it out, but I think very, very hard for people to really do. Yeah, it sounds really straightforward, but then it remains a really powerful piece of advice because it remains so difficult to achieve it in your life, especially for women. For sure. And even in the book—the introduction was written by Frank Crowninshield, who was the editor of Vanity Fair, and it’s very tongue-in-cheek and essentially makes fun of the idea that the live-aloner who is self-sufficient is going to be absolutely fascinating and seductive to men, because she seems like she doesn’t need us! But for Marjorie Hillis, men barely figure in the book at all. Every now and again a guy pops up who is attracted by this self-sufficient woman, but more often than not, the women are leaving men. She’s got tons of women who are getting divorced from their terrible husbands and packing up and leaving and pursuing the life that they really want. It’s very much not about the idea that you’re playing hard to get throughout the whole book. Men are a part of the world and you have to deal with men, but she’s really not focused on how women’s happiness appeals to men. The Extra Woman is available now on Amazon.